Yeomanstown Stud has long been hailed as the home of Dark Angel (Ire), but it is his stablemate Camacho (GB) who has stolen the limelight this year, siring Classic winners and a Royal Ascot winning 2-year-old in Signora Cabello (Ire). With Signora Cabello now aiming for the G1 Prix Morny, David O’Callaghan talks all things Camacho with us. TDN: David, Camacho has been having a great year on the track. Tell us how you came to stand him. David O’Callaghan: Camacho is a son of Danehill, who we managed to buy off Prince Khalid Abdullah many years ago. He was trained by Henry Cecil. He was a very good 2-year-old and went on to be a very good 3-year-old. He was second in the Jersey and he was then favorite for the July Cup, but he got injured that day. After that, we managed to buy him to stand here at Yeomanstown. He is a very well-bred horse, his first three dams were all stakes winners. And he was a son of Danehill, which was just something we really wanted. 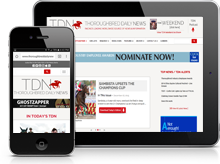 TDN: What were your expectations for this year’s progeny? DOC: Our expectations for this year were high, because he had put together two crops of 2- and 3-year-olds of good numbers. He had 30 2-year-old winners in 2017, and they were going to go on to 2018 and do well, and thankfully, they did, including a French Guineas winner. He had a triple Classic winner in Scandinavia, a Spanish Guineas winner, so the 3-year-old crop stepped up. Then on top of that, this year’s 2-year-old crop backed that up with a good filly, Signora Cabello, who won the G2 Queen Mary and then won the G2 Prix Robert Papin, and hopefully she will go on and win the Prix Morny. On top of that, he has a lot of other smart fillies and colts from the 2-year-olds this year. So we were hopeful and thankfully he has come through. TDN: He has achieved something rather special this year, can you tell us a little about that achievement? DOC: Camacho has had the rare feat of having three individual Classic winners. So far he has had Teppal (Fr) win the French 1000 Guineas for David Simcock, and that was his first Classic winner. Then we had a Spanish Guineas winner, a horse called Another Day of Sun (Ire), who we actually had as a breezer here ourselves. Then he had a filly in Scandinavia, who won three Classics: the Swedish, Danish, and Norwegian Classic. So it was quite a unique feat to put that all together. Well done to all the breeders involved and to everybody who’s had the rub of the green. TDN: You mentioned some of his 2-year-olds that were impressing this year, but Signora Cabello has to be a standout. What do you make of her? DOC: This year his 2-year-olds are flying. Some smart colts, some smart fillies but most notably, as you said, is Signora Cabello. She won the Queen Mary at Royal Ascot then she won the Prix Robert Papin and hopefully she’ll go on and win a Group 1 before the end of the year. She is very smart. What has impressed me about her most is she always looks like she is doing it easy. She has won all of her races with her ears pricked. She looked under pressure in the Prix Robert Papin and then she won in a half-length with her ears pricked, so I’d say we haven’t seen the best of her yet. She looks like she has more in the tank every time she runs. TDN: Why was her win in the Robert Papin so significant? DOC: Her win in the Prix Robert Papin was significant because it wasn’t that she just won the Queen Mary and disappeared. She backed it up, so she is a genuine, proper good 2-year-old. Often horses can win a race but they don’t back it up. This proves that she is the real deal, and hopefully will go on and back that up even further when she goes into Group 1 company. It is significant for the stallion also. It shows that, given the chances, he’ll upgrade your mares, and he is capable of getting a good horse, which is what everybody wants to breed. They don’t want to just breed 2-year-old winners, they want to breed good horses. Camacho has done it with 2-year-olds, 3-year-olds, at five, six, seven and eight furlongs. It shows that he is versatile and he will upgrade the mares. TDN: What is a typical Camacho? DOC: He is a tremendously strong horse with a huge action, he puts that big walk into everything. When we pull him out in the stallion yard, he is very impressive to look at, from his action to his strength and quality. His stock all have big hips and a big walk but they look like sprinters, which is what they’re bred to be. He is a pretty easy horse to breed to. Big, strong, and fast. TDN: What are his yearling crop like? DOC: The 2018 crop is his biggest yearling crop and probably his best bred, too. Physically, they look like a very good bunch, so we’ll be hopeful that next year will be better again. He has the numbers, he has the quality, so we’ll be hopeful that it will come to fruition next year that he’ll have a better year again, and a higher class of horse year on year.